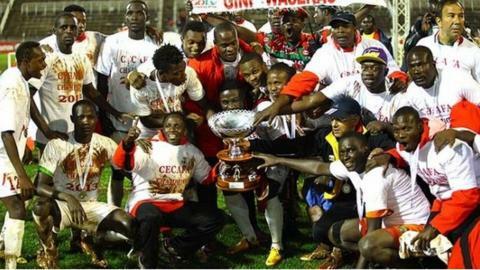 South Sudan were joined in the quarter-finals of the 2015 Cecafa Senior Challenge Cup by hosts Ethiopia, reigning champions Kenya and record winners Uganda. Having only been recognised by Fifa in 2012, South Sudan have quickly set about building a reputation. On Friday they shocked guest side Malawi 2-0 at the Bahir Dar Stadium, thanks to goals from James Joseph Saeed Mogaand Bruno Martinez, to finish top of Group C and book their place in the last eight of the tournament. "This is good for our country and we shall celebrate this today," said Martinez after the game. Malawi are also through to the last eight despite the loss. On Saturday, hosts Ethiopia needed a late own goal to draw 1-1 against Tanzania at the Hawassa Stadium to qualify as one of the best third placed teams. Simon Msuva netted in the 51st minute for Tanzania in the Group A match, but coach Yohannes Sahle's side kept pushing forward only for Salim Mbonde to score in his own net at the stroke of full-time. While the four time Cecafa Senior Challenge Cup winners Ethiopia had to wait for an own goal to qualify, defending champions Kenya had Uganda Cranes to thank for their progress, after Uganda beat Burundi 1-0. Substitute Frank Kalanda replaced Muzamil Mutyaba and netted Uganda's winning goal for the 13-time record winners to ensure both they and Harambee Stars went through. The result meant Kenya finished in second place in Group B, despite their 3-1 defeat to Zanzibar on Friday. Also on Friday, Sudan won their first match at the event beating Djibouti 4-0. Djibouti were eliminated while Sudan advanced as one of the best third-placed sides. In Group A Rwanda were 3-0 winners over Somalia, who crashed out of the tournament after three straight defeats. The knock out stage will now shift back to the Addis Ababa Stadium. On Monday, Uganda Cranes will face guest side Malawi in the first quarter-final before Tanzania take on Ethiopia the same day. On Tuesday, South Sudan will battle arch rivals Sudan before Rwanda take on defending champions Kenya.